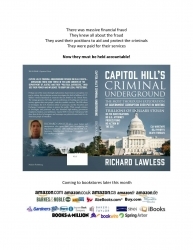 With the release of the non-fiction book, "Capitol Hill's Criminal Underground," the authors believe Americans will finally be told about one of this country's longest running, government supported criminal enterprises. The book aims to name the individuals and present the evidence of their crimes. This story is about the Capitol Hill’s Criminal Underground: a loose association of bad actors that call Wall Street and Capitol Hill their home. After three years of extensive work with the FBI, U.S. Attorney's and America's intelligence agencies, the author is confident that what you are about to read is a true story. No names have been changed and those involved have been identified. The author claims this is a story about one of the longest running government protected, criminal enterprises in the history of our country. It is a story about the successful efforts of a few hucksters to transfer massive amounts of wealth from the hands of tens of millions of innocent Americans into the hands of a few thousand powerful people. Unlike most books you may read, "Capitol Hill’s Criminal Underground" will focus on real events while unmasking those who thrive in the dark corners of the Department of Justice and their “Political Overseers” who use their power and influence to usurp our legal protections.